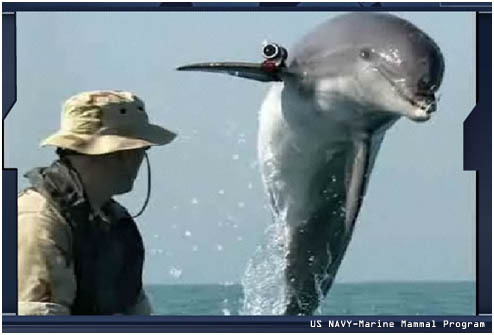 A dolphin wearing a camera on its fin is a very effective survellance tool. Dirk and Sully both know that navies from the United States and Russia use marine mammals for underwater missions. But did you know it’s true? More than 60 years ago, the Navy began training marine mammals to help them out underwater. Naturally, marine mammals are much better at reconnaissance missions than human scuba divers. For one, they don’t get the bends- also known as decompression sickness. They can swim fast over long distances, and they can be relied on to learn tasks and perform them. Let’s face it, they’re just much better in the water than people. The Navy started working with different marine mammals to see if they could be trained to search for, detect and mark the location of objects in the water. They wanted to locate things like mines, downed aircraft and navy personnel. They also experimented with using mammals to deter sharks from attacking personnel in the water. Now, they mostly use dolphins, but in the early days of the program, they worked with killer whales, pilot whales, belugas (white whales), Steller sea lions, grey seals and fur seals.